The history of the springs is as follows: In the summer of 1868, New Yorker Col. Richard Dunbar was in Waukesha and asked where he could get a good drink of water. He was directed to one of the many springs in the area, began to drink, and felt refreshed. His diabetes seemed to be relieved. Upon his return to New York, he again became ill, and decided that there must be some powerful curative agent in the Waukesha spring water. Dunbar returned to Waukesha, bought 40-acres of land where the spring was located, and named it “Bethesda” after the Jerusalem spring where an angle bestowed healing powers. He had a home built, covered the spring with a pavilion, and created park grounds surrounding it. News of the curative powers of the springs made their way into national publications and summer travelers began to flock to Wisconsin to get a taste of the spring waters for themselves. A large group of well-dressed people gathered around a gazebo at Besthesda Springs. Springhouses were erected to protect the purity of the water and mark the locations of the springs. The springs themselves had names such as Silurian, Bethesda, Horeb, Hygela, Glen Rock, Henk, Crescent City, Almanarius, Clysmic, Arcadian, Sotarian, Acme, White Rock, Lithia…the list goes on and on. 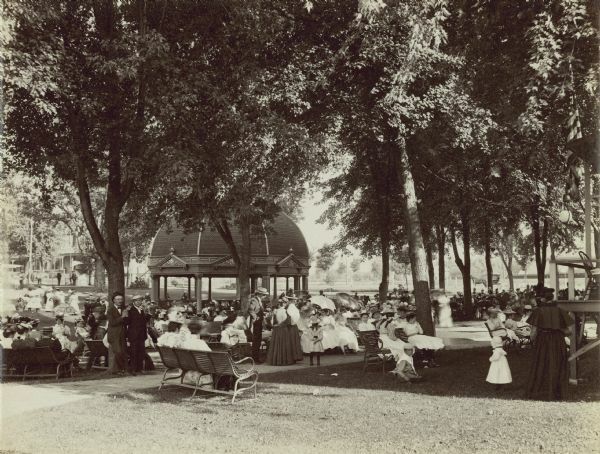 It is estimated that about 60 mineral springs were located in Waukesha from 1868-1918. Many of these springhouses no longer exist, but their locations are remembered in the Historic Preservation Days of May in the City of Waukesha. Arcadia spring was located on the corner of Arcadian and Hartwell Avenue. The Arcadian Mineral Spring Company was incorporated in 1885. The original bottling house did not need to use any pumps, as the packaging area was 300 feet from the spring and 12 feet below, thus being carried by its own pressure. The company also boasted the lining of the inside of its pipes and cylinders with silver for the entire length from the entry of the spring to depositing in bottles.3 Lithia Spring was located near Arcadian spring, along Hartwell Avenue. It opened in 1891, and had its water bottled in olive-green glass bottles. Clysmic spring, pictured in the titled image for this post, was located where Pioneer Hall now stands at Carroll University. Silurian and Bethesda springs will be covered in more detail in the following articles. 1Schoenknecht, John. The Great Waukesha Springs Era: 1868-1918. 2003. Discover what Milwaukee makes – cream city ribbon!